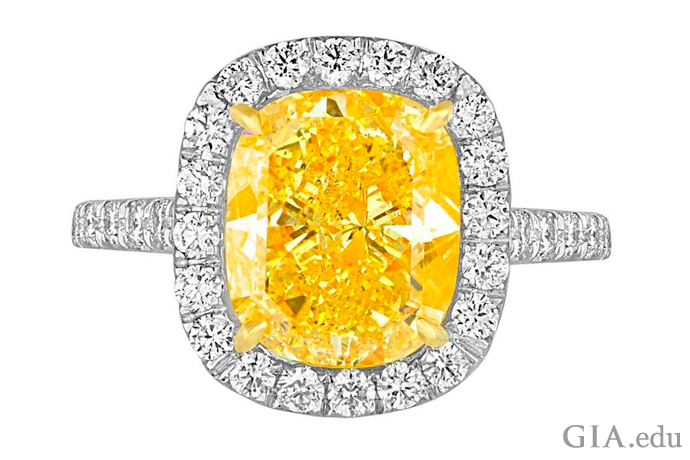 A yellow diamond engagement ring is a stunning choice to celebrate your love. But picking the perfect engagement ring requires knowing about yellow diamonds, mountings, the effect of metals on appearance, treatments and more. We offer help. Understanding diamond color is essential before you go shopping for a yellow diamond engagement ring. Most colorless or near-colorless gem-quality diamonds are graded based on the absence of color, using GIA’s D-to-Z diamond color-grading system. Yellow diamonds are considered to be colored diamonds and are graded as “fancy” when they have more color than the Z masterstone. 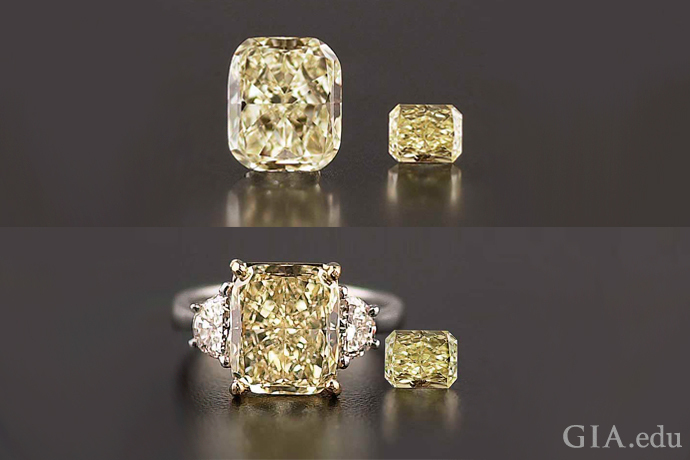 Here is another important difference between yellow diamonds and colorless diamonds. Diamonds in the D-to-Z range usually decrease in value as the color becomes more obvious. The opposite happens with fancy-color diamonds. Their value generally increases with the strength and purity of the color. The names used to describe colors are often quite subjective. Consider that the color yellow includes variations like butter, lemon, golden and more. To bring objectivity and standardization to the grading of the rare beauties that are colored diamonds, GIA created the GIA Colored Diamond Color Grading System in the 1950s and refined it over the decades. This grading system not only defined the processes for determining a diamond’s color, but it also established the terms, or color grades, for describing it. GIA’s grading system places most colored diamond in one of nine categories based on the diamond’s hue, tone and saturation: Faint, Very Light, Light, Fancy Light, Fancy, Fancy Intense, Fancy Dark, Fancy Deep and Fancy Vivid. The first three grades aren’t used for yellow diamonds, so the scale for yellow begins with Fancy Light. 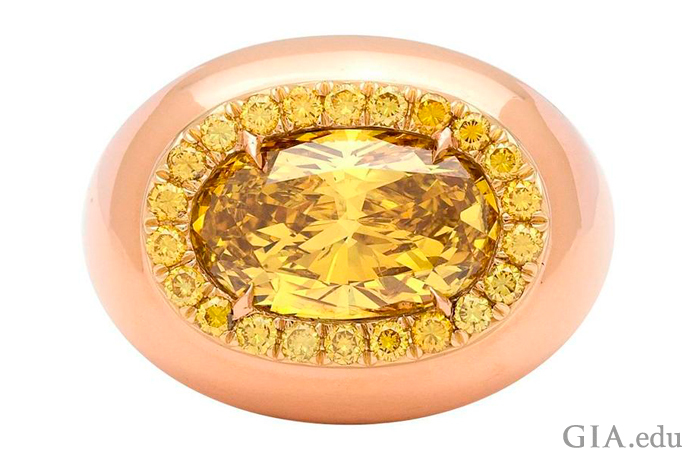 The majority of yellow diamonds in the jewelry industry are graded Fancy Light, Fancy, Fancy Intense and Fancy Vivid. In general, the more color a colored diamond has, the better. Fancy Deep and Fancy Vivid diamonds, for example, have more color than Fancy Light diamonds—and are usually more valuable. However, tone (the degree of darkness or lightness of a color) is also important. For example, a diamond that is extremely dark (Fancy Dark) may be less desirable than a lighter stone graded Fancy Intense. 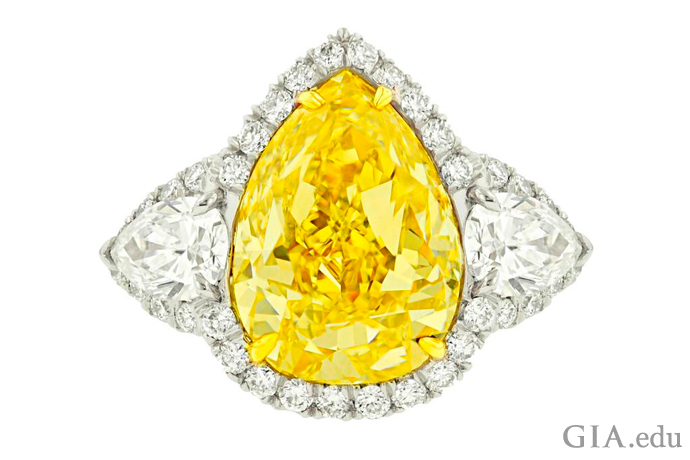 It is not unusual for a yellow diamond to have a hue modifier, such as orangy yellow or greenish yellow. A modifier does not indicate that the color is any less strong or pure. Round diamonds cut in the brilliant faceting style are the most popular diamonds for engagement rings, but you may have a challenging time finding a round stone for your yellow diamond engagement ring. That’s because yellow diamonds typically display a more intense face-up color appearance when they’re cut in a shape other than round. These non-round shapes are called fancy shapes, which include oval, pear, marquise and heart, plus square or rectangular cuts like princess, radiant and emerald. If your heart is set on a yellow diamond engagement ring, you will probably look at a number of loose yellow diamonds. Be aware that the yellow diamond that has caught your eye may appear darker when set in a mounting. Look at the photos below. The diamond on the left in the top image was graded Y–Z range, just on the light yellow/Fancy Light yellow boundary. It is shown next to a Fancy yellow reference diamond. In the bottom image, the larger diamond is mounted in a ring and placed next to the same reference diamond. This effect can actually work to your advantage, particularly if you’re deciding between a less expensive “light yellow” diamond at the very low end of the D-to-Z color scale and a more expensive Fancy yellow diamond. Diamonds are highly reflective. Their facets are like tiny mirrors, reflecting their surroundings, which include the color of the ring and the prongs holding the gem. Because of this, the color of the metal will affect a diamond’s appearance. 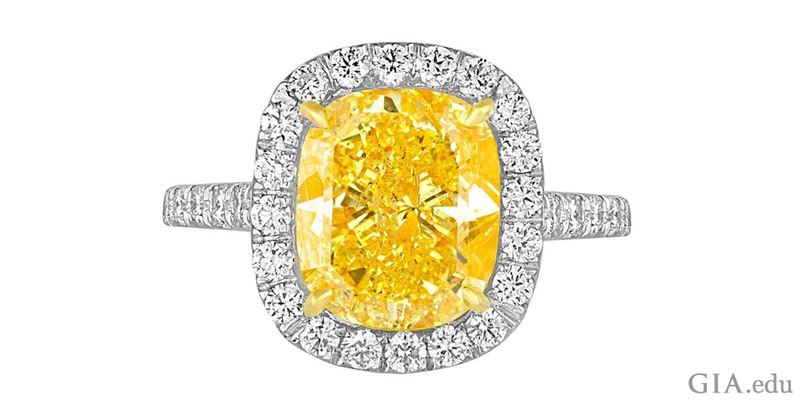 Do you want your engagement ring to highlight the color of the yellow diamond? White metals and rose gold will create contrast between the mounting and the stone. White gold makes for a streamlined, sophisticated look. A rose gold mounting will create a warmer contrast. Do you want your ring to complement the color of the diamond? A yellow gold mounting will harmonize with a yellow diamond. Take a look at Art Deco style engagement rings, Retro style engagement rings and ring styles typical of the Victorian era, times when yellow gold was in fashion, to see if these are designs you’d like to recreate for your yellow diamond engagement ring. 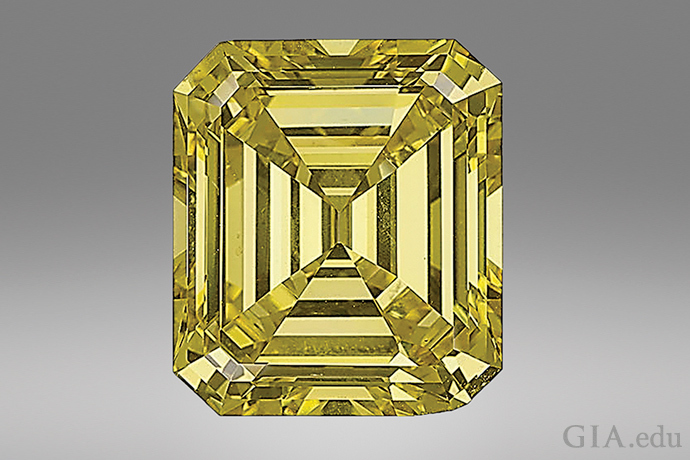 High-pressure, high-temperature (HPHT) annealing can change some diamonds to yellow. 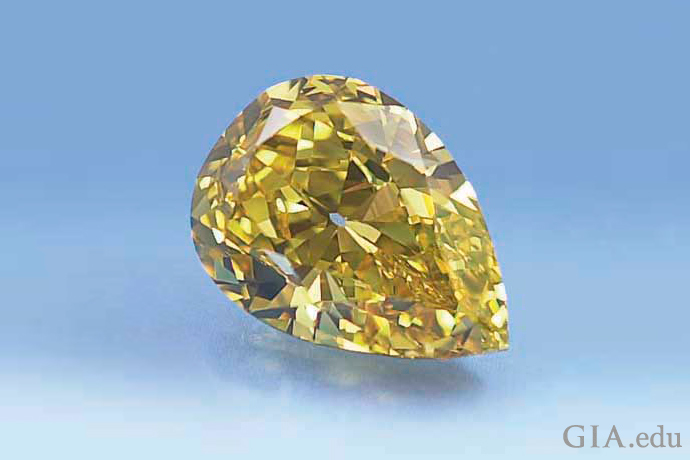 Artificial irradiation with subsequent heating (annealing) above about 500°C can be used to induce a deep yellow color in a diamond. In both cases, the treatment is considered permanent under normal conditions of wear and care. Non-permanent treatments, like coatings, are also possible. All else being equal, diamonds that have not been treated are more expensive than diamonds that have been treated. Legally, the seller must disclose any treatments. GIA can detect these treatments, and it identifies them in the GIA Colored Diamond Grading Report. It also laser inscribes “HPHT PROCESSED” or “IRRADIATED” on the girdle of diamonds treated by either of these methods. Synthetic yellow diamonds – with properties that match their natural counterparts – are also being manufactured. The first synthetic diamonds were grown by HPHT processes that mimic the high-pressure, high-temperature conditions of natural diamond formation in the earth. Today, chemical vapor deposition (CVD) is another common method whereby synthetic diamonds are grown in an apparatus that uses high temperatures and low pressures in a vacuum chamber. The CVD process involves heating a mixture of a hydrocarbon gas (such as methane) and hydrogen, which releases carbon atoms that then settle onto the cooler, typically square-shaped seed plate of natural or, more likely, synthetic diamond. With both techniques, subsequent treatments may be used to change the color of the original crystal. GIA can detect synthetic diamonds grown using either HPHT or CVD, and it issues distinctive reports for these synthetic or lab-grown diamonds. 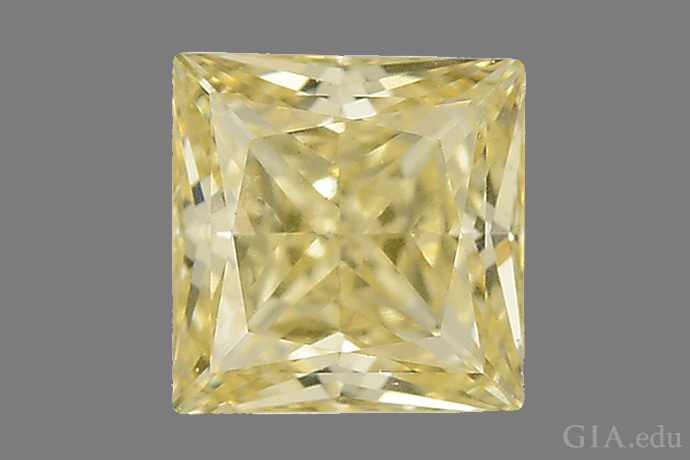 The GIA Synthetic Colored Diamond Grading Report offers the same information as the GIA Colored Diamond Grading Report issued for a natural diamond (see below), but it provides a more general description of the color and clarity. 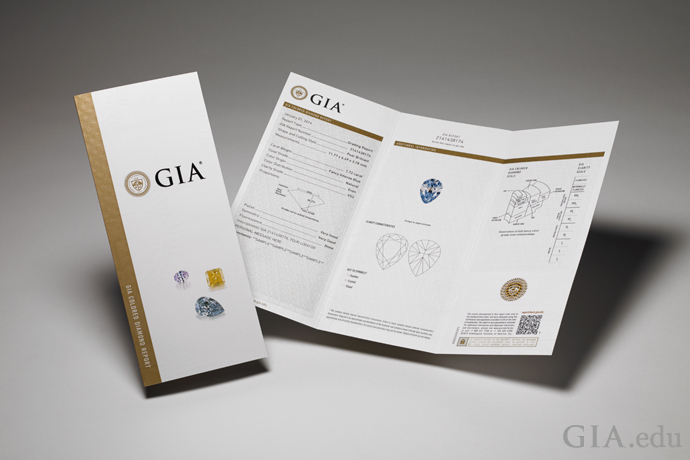 For additional disclosure and identification, GIA laser inscribes the diamond’s girdle with the stone’s unique report number and a statement that it is laboratory grown. The report itself looks markedly different from those issued for natural diamonds. A yellow diamond engagement ring is a symbol of your love. It’s also a significant emotional and financial investment. So you’ll want to make sure the diamond is graded by a trusted, unbiased lab like GIA. GIA’s meticulous grading process involves testing to determine whether the diamond is natural or lab grown and to identify any known treatments used to enhance its appearance. Highly trained colored-diamond graders observe the diamond face-up using controlled lighting in a specially designed viewing box that eliminates distractions and shields the stone from external light. These specialists determine the diamond’s characteristic color based on a combination of its size, shape, faceting arrangement and color. They then bracket the diamond using side-by-side comparisons under the same lighting conditions with two or more color references. On the basis of these comparisons, they select one of 27 hues (such as orangy yellow, yellow or greenish yellow) and assign a specific “fancy” grade based on the hue’s tone and saturation. A GIA Colored Diamond Grading Report provides a full quality assessment of a colored diamond including the color grade, color origin (natural or treated), carat weight, clarity and a plotting diagram of its clarity characteristics. As an optional service, a full-color image of the diamond may also be included. 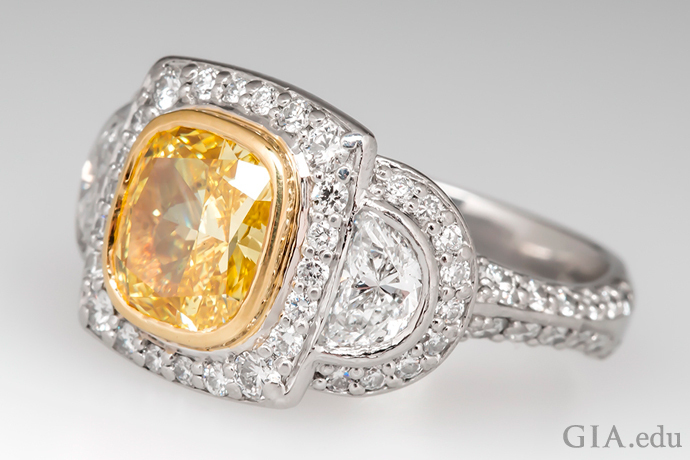 When you wear a yellow diamond engagement ring, you’ll have something unusual on your finger. 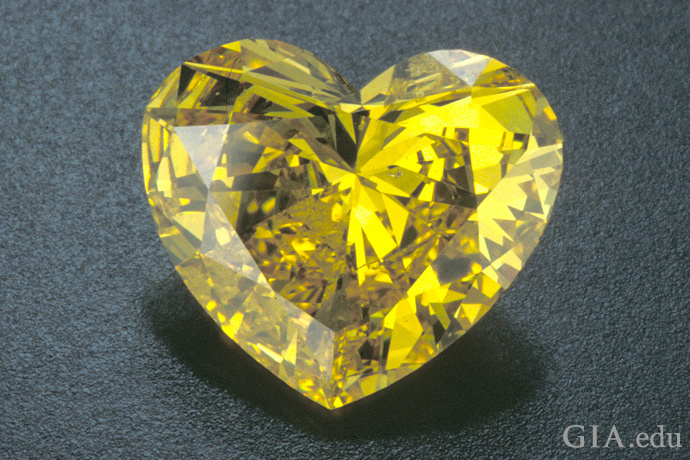 In the early 2000s, for example, yellow diamonds represented only 2.4% of all diamonds submitted to GIA for various grading reports over the course of a single year. If unearthing a diamond is noteworthy, then discovering a yellow diamond is like finding a golden needle in a haystack. 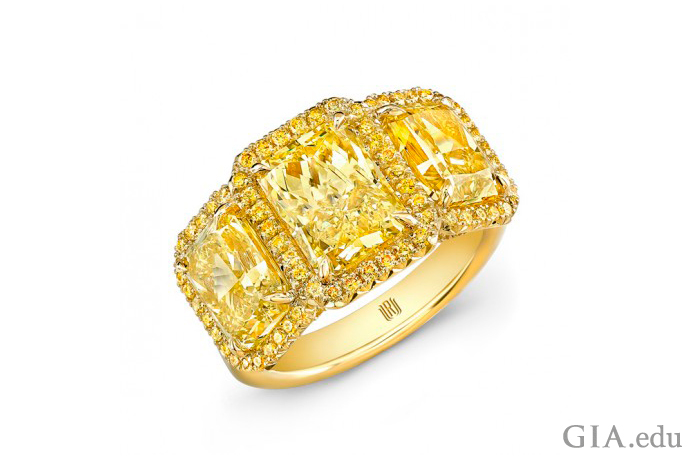 Still yearning for a yellow diamond engagement ring? 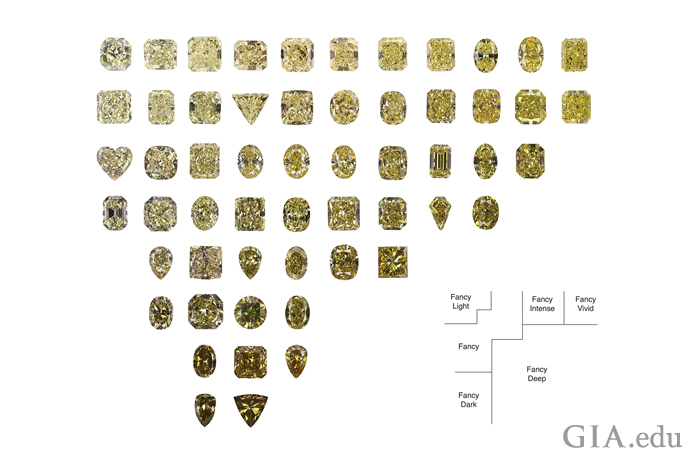 Dig a little deeper to learn more about yellow diamonds.